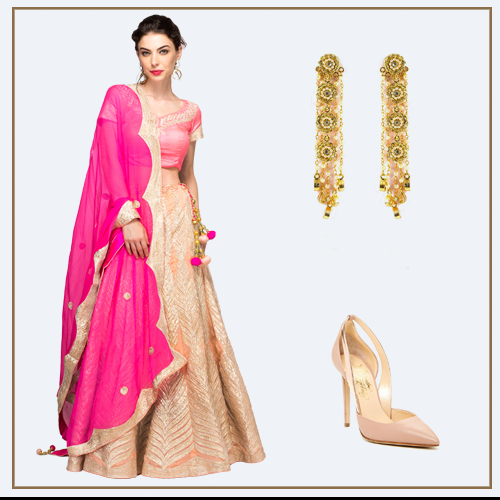 How To Look Super Elegant At A Wedding - For Rs 2,000 Or Less! Planning for that high-profile wedding but clueless about what to wear? We got your back, girl! Not everyone can afford those pretty designer lehengas and expensive accessories to go with them. That’s why, we sought the expertise of some of POPxo’s staffers and found out what makes one look super chic at weddings without spending a bomb. Hold your breath, because these hacks might just be what you need in life! If you’re wearing a lehenga for a wedding, a smart way to save is to just spend on your apparel. Instead of buying a new lehenga for every wedding you attend, just rent beautiful designer pieces. You can always wear any kind of shoes under your lehenga without them getting noticed (out of sight, out of mind remember?). Pick an old pair of flats (that match the outfit) if you’re looking for comfort and heels if you want to add height to your frame. And jewellery can always be reused without the fashion police calling you out for it. If you’ve received your wedding invitation waaay in advance, you are likely to have enough time to plan for it. And hence, you should always aim to get your look in order. You don’t have to buy every element of your look all at once. You could spend on a gown one month and on shoes the other, while jewellery can follow subsequently. You could also rehash old jewellery to keep your budget in check. You could have a brilliant look just by putting some thought into it, just like this beautiful gown. Pair it with a sequinned clutch and standout earrings. 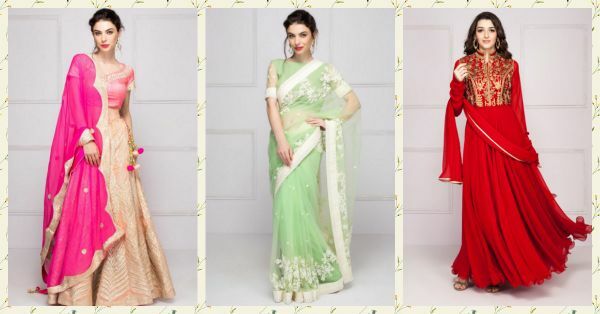 Want to wear a beautiful designer saree to a wedding but can’t afford it? Don’t worry. Make heads turn in fabulous designer and branded rentals from Flyrobe! These beauties cost a small fraction of the price you’d pay at stores and other websites and the lovely people at Flyrobe come to your home to get every piece custom-fitted to your size. What’s more, they even rent accessories to complete your look. 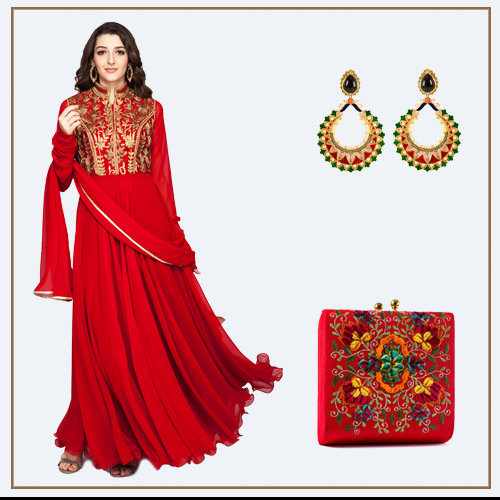 Pair your saree with a statement clutch and earrings for a day wedding. Really is swaggerific, isn’t it? You know the best person to go to when you need outfit advice for weddings? Mom! Raid her closet for beautiful, vintage pieces of jewellery and other accessories and give it your own spin by pairing it with your favourite outfit. That way you save on spending on separates like jewellery and clutch. If you are the same shoe size as mommy dearest, you should thank your stars. Because shoes can sometimes cost the most of an entire look. An embroidered clutch like this goes best with a flowy anarkali and earrings for a sangeet function. Thanks ma! Pimp out an old saree or suit with chunky and/or statement accessories. That way, you only end up paying for the accessories and can stick to your budget. Statement earrings can always lift your old outfit and give it a new spin. Simply perfect for a ring ceremony, just like this gold saree, earrings and bangle. Another way to make an old outfit look like it’s brand new is to mix and match. How to do it? Simply pick a dupatta that goes with any of your suits or jacket-style lehengas, make sure it matches at least one or two colours on your outfit and accessorise accordingly. At zero cost, you’ll have an outfit that no one’s ever seen before. Moreover, try not to use accessories that you wore the last time you picked the same outfit. New accessories can also breathe life into an outfit you’re looking at reusing. 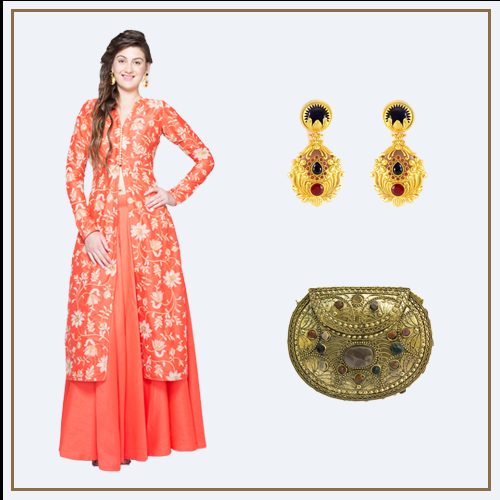 Just like these earrings and clutch add freshness to this beautiful lehenga.